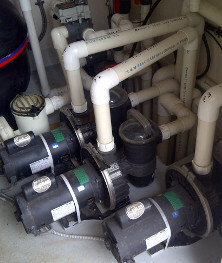 ﻿ Argosy Pools Ltd - Pool and Spa Service in the GVRD. Our fully qualified maintenance staff can, with minimal use of our quality Mursatt® chemicals, keep your pool and/or hot tub clean and healthy year-round. Whether you want us to stop by twice a week or twice a month, a maintenance schedule can be tailored to your specific needs. So if you’re tired of seeing Dad waste his Saturday looking after the family pool, give him a break and call us today to set up a free site inspection and quote. From re-plumbing an entire pump room to replacing a leaky pump seal, our team of experienced technicians can get it done. We are a registered gas contractor with class B gas-fitters on our staff, so call us today to ensure your heater will run trouble free throughout the season. 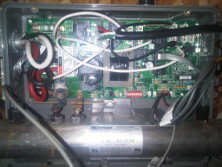 We can winterize, de-winterize, assess and repair any piece of pool equipment, any hot tub, or any solar system. If you have the knack for doing it yourself, you can always bring your spa pump or entire spa-pak down to the shop and we’ll repair it for you here, which would cost less than having us make a service call to your home. We have a GFCI equipped “wet-bench” so we can duplicate and troubleshoot any problem you are having with any brand of spa equipment.